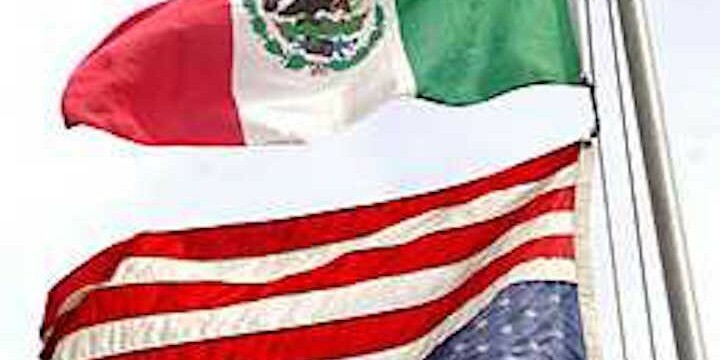 U.S. flag flying upside down and below Mexican flag-Truth! - Truth or Fiction? 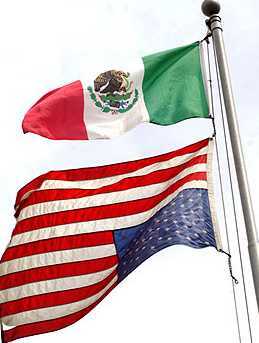 U.S. flag flying upside down and below Mexican flag-Truth! 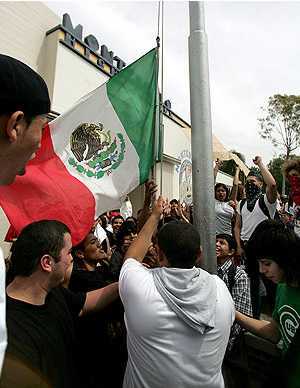 Picture of American Flag Upside Down and Flying Below a Mexican Flag at a California High School-Truth! 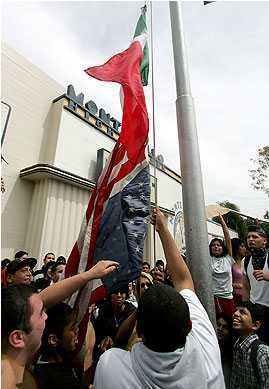 Several pictures said to be from Montebello high school in Montebello, California, that show students raising the Mexican flag with an American flag flying below it and upside down. The email also includes commentary about the future of American, but the main feature of the email is the pictures of the flags. The pictures are true. They were taken at Montebello high school on Monday, March 27, 2006. The students were part of a walkout aimed at influencing Congress, which was debating immigration policy and the potential of cracking down on illegal immigrants in the country. Although the flag-raising took place at Montebello high school, officials of the Montebello Unified School District were quick to point out that the protesters were not students from Montebello high school. Assistent Superintendent Robert Henke said the high school was under a lockdown and all the students were in their classrooms. He said that the 800 to 1000 students were from neighboring school districts such as the El Rancho Unified School District and the Whittier Union High School District. They marched to Montebello high school, lowered the flags, replaced the school flag with a Mexican flag, flew the U.S. flag upside down, and stole the California flag that had been on the pole. American flag v. Mexican flag at CA. high school–disgusting public acts! FLAGS FLYING AT MONTEBELLO HIGH SCHOOL SAYS IT ALL…. THE AMERICAN FLAG COMES SECOND! at Montebello High. Our laws state that NO Flag will fly higher than the US Flag, so why does an American school in the USA allow this??? How is this acceptable? These students are in America , not Mexico !!!!! If you want to stay here, America comes first, last ,and always otherwise go back and make it better where ever you came from but don’t try to turn my country into yours by ILLEGALLY entering mine and then demanding all the benefits of a LEGAL citizen of our nation ….. NO funding from federal tax dollars for any student out of class that day or any other day for such subversive activities…….teacher led or not. Years ago, U.S. Senator from California , S.I. Hayakawa, suggested that English be made the official language of the USA . He was belittled for suggesting it. The battle for our secure borders and immigration laws that actually mean something, however, hasn’t even begun. Like I said: Welcome to reconquista. If we ever forget that we’re one nation under God, then we will be a nation gone under!